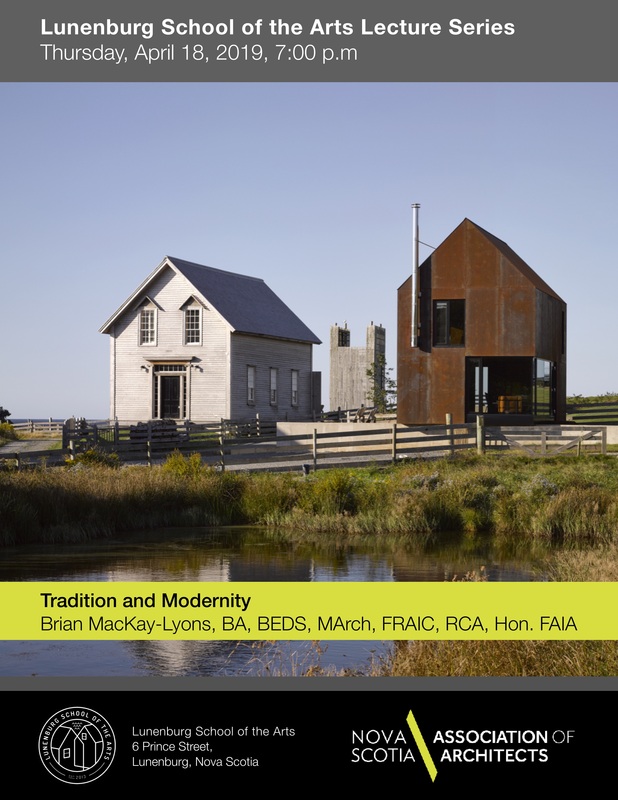 Nova Scotia Association of Architects, South Shore Chapter / Lunenburg School of the Arts, Lecture Series 2019 with Brian MacKay-Lyons. Innovation is overrated in Architecture today. Much of what is considered as innovation is merely fashion or novelty – what architectural historian Peter Buchanan has called “the cult of the compelling object.” Originality requires returning to origins. I have long been interested in the anthropological beginnings of culture/architecture. All of our work can be seen as a sustained search for the timeless, archetypal forms, which have deep human currency both across cultures and through history. In order to achieve this minimalist clarity (Vitruvian “claritas”) all superfluous elements must be stripped away, leaving only the essential. The building and its parti then become one and the same. Tradition and modernity become meaningless distinctions. Brian MacKay-Lyons was born and raised in the village of Arcadia in Nova Scotia, on the East coast of Canada. Brian received his Bachelor of Architecture from the Technical University of Nova Scotia in 1978 and his Master of Architecture and Urban Design at the University of California Los Angeles, in the United States. 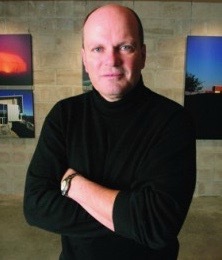 He has developed a leading global practice from Nova Scotia that has been honoured with over one hundred design awards including the Royal Institute of British Architects International Fellowship, the Royal Architectural Institute of Canada Gold Medal and three American Institute of Architects National Honor Awards. 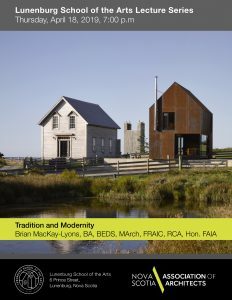 Brian is also an Honorary Fellow of the American Institute of Architects and a current professor of Architecture at Dalhousie University in Halifax, Nova Scotia. Twenty years after founding the firm Brian MacKay-Lyons Architecture Urban Design, Brian partnered with Talbot Sweetapple to form MacKay-Lyons Sweetapple Architects Limited. In 2017, Brian and Talbot were honoured as laureates of the prestigious Global Award for Sustainable Architecture by the Cite de l’Architecture et du Patrimoine in Paris, under the patronage of UNESCO. May 16: Film/Part 2 of a Design Trilogy: OBJECTIFIED – The Role of Everyday Non Living Objects and the People who Design Them. September 26: Krista Boehner NSAA: Aging in Place – A Visit to the Residenz, Wurzburg, Germany. October 17: Film/Part 3 of a Design Trilogy: URBANIZED – A Look at Issues and Strategies behind the Urban Design of Cities. November 21: Philip Nortje APALA & Sharon Fogo NSAA, MRAIC FRAIC: Commemorative Spaces – The Creation of Shared Meaning and Remembering.